An Electoral Commission building in Yumbi town, that was partially destroyed during inter-communal violence in December 2018 (file). Nearly 900 people were killed in ethnic violence in the Democratic Republic of Congo in mid-December, the United Nations Human Rights office said Wednesday. "The U.N. Human Rights Office said Wednesday that according to allegations from credible sources, at least 890 people were killed between 16 and 18 December in four villages in Yumbi territory, Mai-Ndombe province in the west of the Democratic Republic of the Congo, in what appear to have been clashes between the Banunu and Batende communities," a statement read. Most of the population of the nearby villages have been displaced, including an estimated 16,000 who crossed the Congo River into neighboring Republic of Congo, according to the statement. The U.N. has launched an investigation into the mass killing, as have national judicial authorities. "It is crucial that this shocking violence be promptly, thoroughly investigated, and the perpetrators be brought to justice," U.N. High Commissioner for Human Rights Michelle Bachelet said. 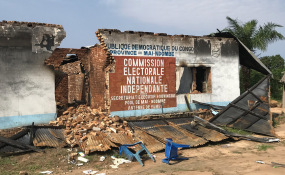 Earlier this week, a local priest said at least 400 people had been killed, causing election officials to cancel voting in the region, Reuters reported. It was not immediately clear whether the violence was related to the recent presidential election, which has been contested by the runner-up.